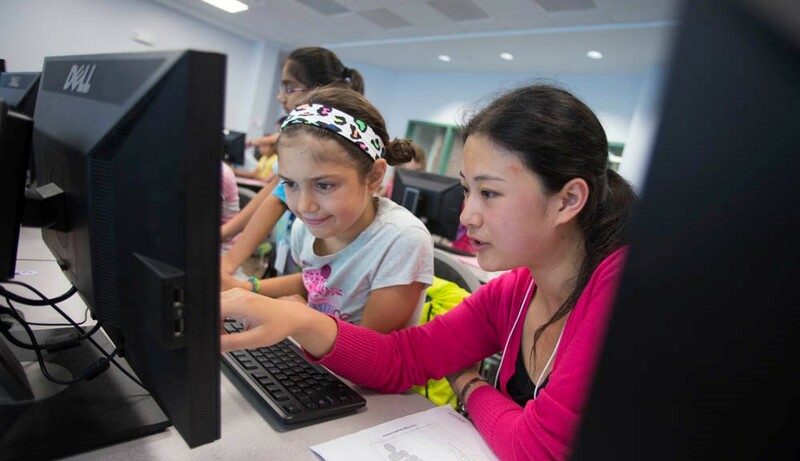 In an effort to get more girls involved and passionate about STEM, a partnership of WPI, Dell Inc., and Girls, Inc. is using combined resources to bring a Girls Who Code club to WPI in the fall. Always seeking ways to strengthen the STEM pipeline and get girls interested in science, technology, engineering, and math, the three partners are each bringing their distinct expertise to invite girls to explore something new, have fun doing it, and maybe, just maybe, move on to a STEM career. “We started thinking of this after the Girls Who Code Scholarship came up,” says Suzanne Sontgerath, director of pre-collegiate outreach programs at WPI. In 2016 WPI announced five $20,000 Girls Who Code Scholarships for alumnae of the Girls Who Code program. Amid all the outreach programs WPI is involved in, coding seemed to be a natural fit and one where there’s great need. While exploring the feasibility of launching the club, the stars aligned for the partnership. Sontgerath reached out to faculty and students and to existing WPI partners at Girls, Inc., a Worcester-based organization that sponsors research- and evidence-based programs to expose girls to and involve them in STEM activities. Dell also contacted Girls, Inc., exploring ways for their employees to get involved with the organization’s members. “Everyone wants to do something good,” she says. The club will meet weekly for two hours in one of WPI’s computer labs and will run in two sections—a fall semester for 7th and 8th graders and a spring semester for high school girls. The curriculum, supplied by Girls Who Code, is evidence-based and includes computer science concepts in things like music, art, game design, and storytelling to help the girls design and build a project. Groups will remain smaller than 25 students and, based on early interest, Sontgerath sees no problem in the spots filling quickly. Some spots will be held for Girls, Inc. students. Professionals from Dell are volunteering their time and talents to act as mentors and role models to the girls. Nishita Roy-Pope, global lead of programs and communications at Dell EMC Global Centers of Excellence and Northeast Regional Ambassador for Dell’s partnership with Girls Who Code, says the club gives employees a chance to support students in a way that reflects Dell’s mission of building the pipeline of talent for traditionally under-represented groups as well as supporting those groups in order to retain them in the tech industry. “We need to invest in the next generation of talent,” Roy-Pope says. “We cannot afford to wait until girls are in college if we expect them to serve as our future engineers, computer scientists, and doctors—we have a responsibility to empower and nurture our young women.” The facilitators who will meet with club members are members of Dell’s Women in Action, an employee resource group dedicated to advancing women in STEM fields and committed to serving girls in local communities. The volunteers will share their experiences and expertise, and hopefully inspire the students to consider STEM fields, but they will also learn from the girls. By interacting with the students, the mentors will gain an understanding of how to connect with and excite the next generation of talent as well as recognize the barriers that may be preventing the girls from pursuing STEM subjects and develop ways to address those challenges. With the right alignment of an excellent curriculum and the right people to humanize it and bring it alive, the partners have high hopes for the club. “I hope, of course, that they take away some coding skills,” says Sontgerath. “But I also want them to have the sense that they could do this if they wanted to. I want them to think this is something available to them and think, ‘That could be me, too.’” Ideally, she says, the girls might love the club, apply to the Girls Who Code seven-week summer immersion programs when they are older, and then come to WPI.